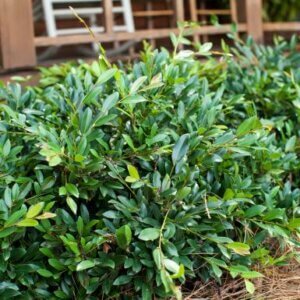 A compact evergreen with coppery-red new growth that matures to blue-green and produces small red flowers in winter. This low maintenance shrub is heat and drought tolerant once established. This shrub has a mounding growth habit and glossy green leaves. The burgundy stems and small white flowers in Spring make for a very attractive shrub. A super tight shrub which can be easily hedged. Clusters of creamy white bell shaped flowers bloom in Spring. 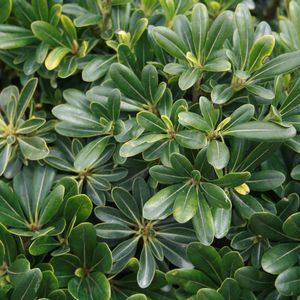 The lighter green new growth will mature to a dark glossy foliage with a leathery texture. A very cold hardy variety with dense green foliage. 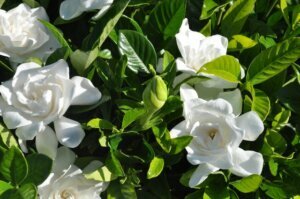 The beautiful, pure white, double flowers are highly fragrant. 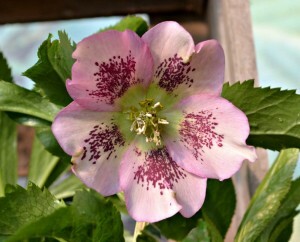 Helleborus, or Lenten rose, is a shade-to-part-shade loving bloomer that produces flowers when most other plants are dormant. It blooms during cold weather months (November into March). There are many varieties which can grow anywhere from 12 to 24 inches in height. Flower colors come in delicate shades of white, green, pale pink, rose, yellow, purple or sometimes combinations of these. The foliage is deer-resistant, and continues to grow and replenish itself during the summer. 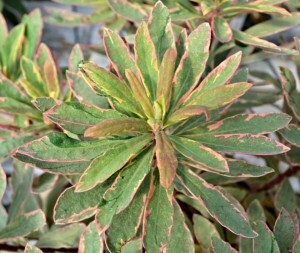 Euphorbia, or spurge, prefers partial shade to partial sun depending on the variety. 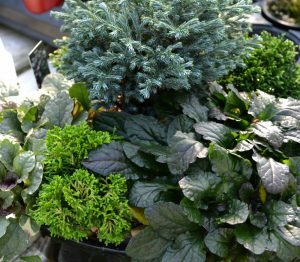 Its foliage comes in shades of chartreuse, dark green or even burgundy-tinted green. 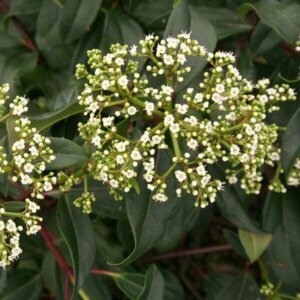 It blooms in the spring through early summer with clusters of tiny red-centered flowers that match the plant’s foliage. Some types can grow to the size of small shrubs up to three feet tall. This plant is also deer-resistant. 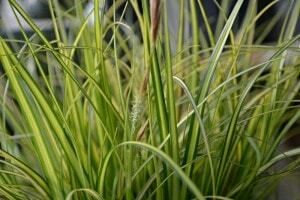 Japanese sedge, or carex grass, provides an alternative texture that creates interest. It’s an ornamental grass-like plant that grows in part-shade to part-sun. The narrow blades come in shades of dark green, chartreuse, bluish green and variegations with creamy white. It makes an excellent low border. 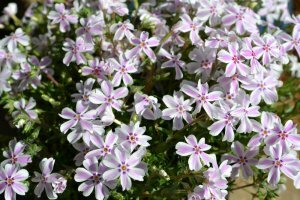 Creeping phlox is a sun-loving ground cover. When it blooms in the spring, it achieves the effect of a carpet of color. For impact, allow it to spill over rocks or a wall. The flowers come in white, shades of pink, lilac and periwinkle blue. Ajuga is a ground cover that can thrive in shade or even sun. It has dark, glossy leaves that can also be tinged with shades of burgundy or almost black. Spikes of blue flowers appear in spring or early summer and are most impressive in mass plantings.